Budin Splint Hammer Toe Straightener helps straighten & align crooked & overlapping toes. Helps keep 'hammer toes' flexible & separates toes that rub and the soft cushion protects ball-of-foot. The Budin Splint Hammer Toe Straightener comes either as a single or double toe straightener. The toe straighteners align overlapping and crooked toes. It holds two adjacent hammertoes or crooked toes in the correct position. 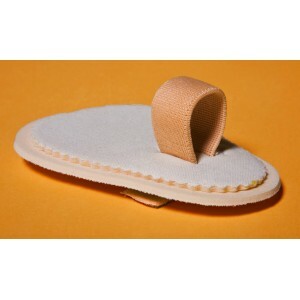 It also reduces the rubbing between toes and provides soft cushion to ball of foot. It fits both the right and left foot. One per package. Recommended Care: washable and reusable. Soft, durable, cotton covered.